Preach so that others will come if only to watch you burn. In C. K. Barrett, we meet a masterful biblical scholar and gifted preacher who never lost touch with his Wesleyan heritage. In the wake of the discovery of his sermon notebooks, it became immediately apparent to Dr. Ben Witherington that these sermons were of immense value for, not only students of modern Methodism and its homiletics but also for theologians and pastors who want to see how the interweaving of insightful biblical exposition and Wesleyan theology can be done with skill and clarity. The sermons in this book were mostly preached in British Methodist chapels and in university chapels between 1934 and 2009. They reflect the labors of a world-renowned scholar with considerable homiletical skill and open a window on superior Methodist preaching. 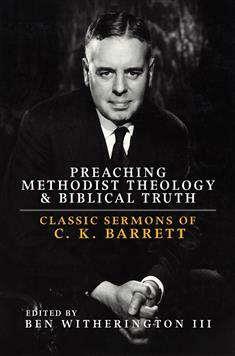 C. K. Barrett is in touch with the original sermons of John Wesley and the hymns of Charles Wesley, but is, at the same time, conversant with modern theology and biblical scholarship. BarrettÆs unique blend of Bible scholarship, Wesleyan heritage, and artful preaching is instructive and still needed in our church if we intend to fulfill our mission to transform the world.